More manufacturers are waking up to the benefits of silent Northbridge cooling: ASUS showed us their A8N SLI Premium motherboard today at Computex Taipei. 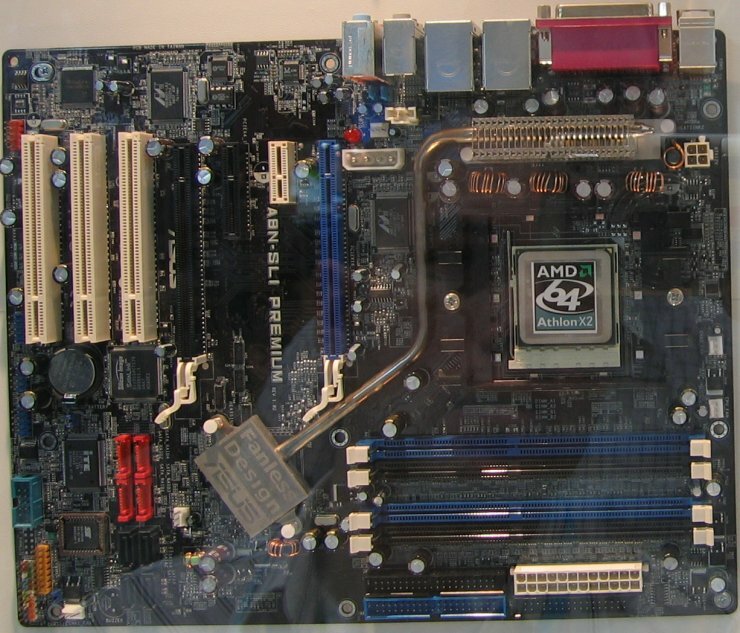 The board features a similar heatpipe solution to the previously reported Abit AN8, but while Abit wisely dumped the bulky parallel & serial ports to make room for the heat exchanger, the ASUS design places it between the CPU and the various backplate connectors. Both boards are based on the NF4 SLI chipset, and so would have identical cooling requirements.&quot;We believe that this design provides sufficient cooling and still offers great overclocking potential&quot; said an ASUS representative. Maybe so, but Abit's OTES approach clearly makes a lot of sense, since the warm air would be vented out the back of the case. In any case, the A8N SLI Premium is fully loaded: Socket 939 and supports AMD X2 dual-core processors, four SATA-II RAID as well as an additional four SATA RAID ports, dual Gigabit LAN and eight channel audio. It also features the same &quot;soft&quot; SLI switch of the current A8N SLI board, whereby you can enable & disable SLI in the BIOS, rather than pulling your PC apart to flick a physical switch. This allows you to work with multiple monitors while in Windows, yet still benefit from the speed boost of SLI in games. The board should be available in the next few weeks, and while exact pricing has yet to be determined, ASUS say it will come in slightly higher than the existing model, due to the extra cost of the heatpipe cooler compared with the cheap heatsink/fan normally used.